I finally made it to boot camp. The Big Green Egg boot camp, that is. I must say, I never did understand the hype around those things. What’s the big deal about some bulky, green grill anyway? Boy, was I wrong! I am now a fan of the Big Green Egg and I can’t wait to get my first one. You read that correctly – first. 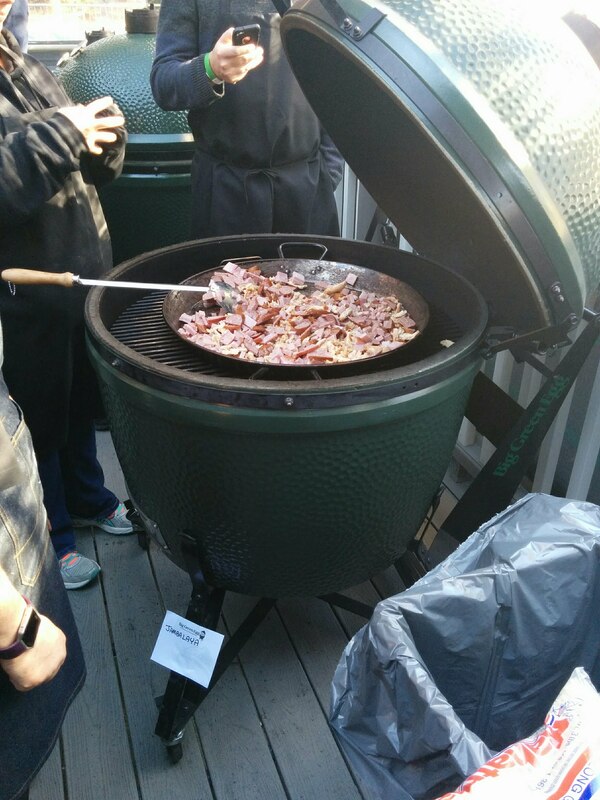 There were attendees of the Big Green Egg boot camp who had three of these bad boys! But I’m getting ahead of myself. The Big Green Egg boot camp was held in the Big Green Egg Culinary Center in Atlanta. This event space is attached to the showroom and is divided by a cool, sliding barn door. The room is spacious with a working demonstration kitchen in the front of the room, a couple of prep areas off to one side, windows and a door to the outside deck, and multiple TVs for viewing the work area in the front of the room. The prep areas were where we did most of the hands-on food prep while the outside deck held the 20 or so “Eggs” we would be cooking on. There were Eggs of all sizes in varying stages of readiness, some of them having been used to cook our amazing breakfast. 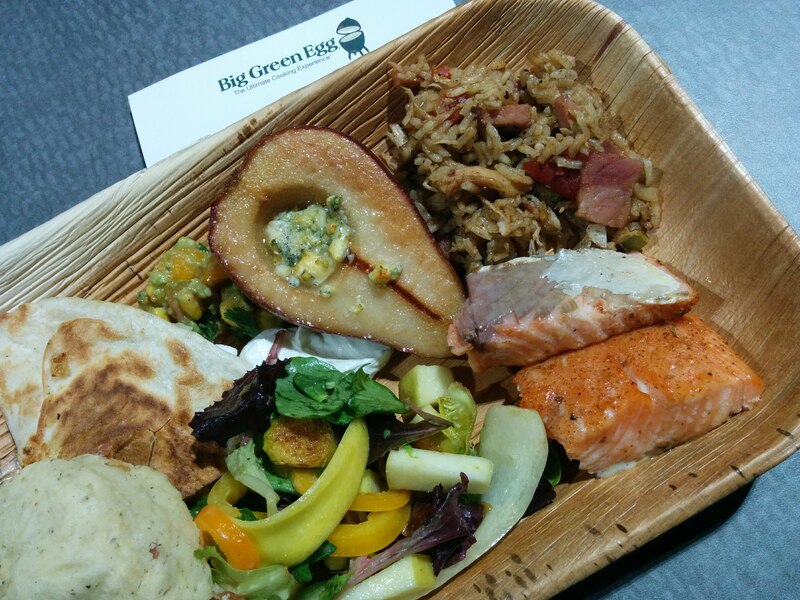 The Big Green Egg Culinary Center is the only one of its kind in North America. I was joined by 29 other Eggheads from all parts of the US for this chance to get personal with these behemoth cooking tools. Connecticut and Florida were in the house and I was told that Canada has even been represented in the past. The staff at Big Green Egg was wonderful. 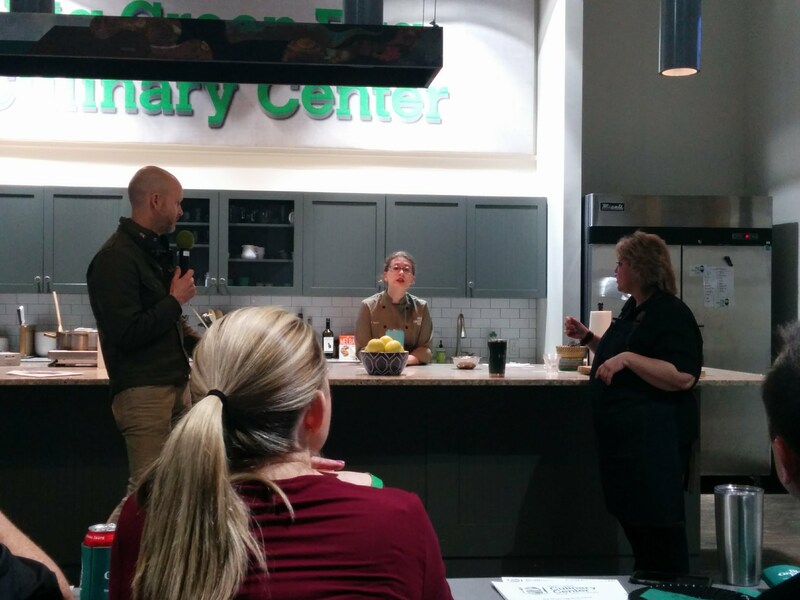 Chef Amanda Egidio checked us in and got us pointed in the right direction, and Chef Taylor Shulman started the show with a brief overview of our day and a demonstration teaching us how to prep beef ribs for the grill. We were then split into groups of 10 and sent off to our prep areas to get hands-on with the meat. A team of volunteers was waiting for us to help us with our tasks. After we cleaned the ribs and rubbed them down with a spice mixture, we went outside to get those bad boys on the smoker and learn how to properly light the Eggs. Throughout the day we met the partners who helped make this boot camp possible. Banner Butter is a local creamery with flavored butters they churn on-site. My favorite was their sorghum butter. Next was Unicoi Preserves. Their preserves are tasty without being overly sweet. And finally, Beautiful Briny Sea. The owner was unable to attend, but she sent a sweet little bag with some samples and we used their salts while we were cooking. Flavored salts are a fun way to add a little extra punch to your dishes. There really isn’t much you can’t do with one of these things. It can be a grill, a smoker, and an oven. The amount of control you have over the temperature is simply amazing. And with all the accessories, you can configure your Egg to cook All. The. Food. The next dish we prepared was pizza. 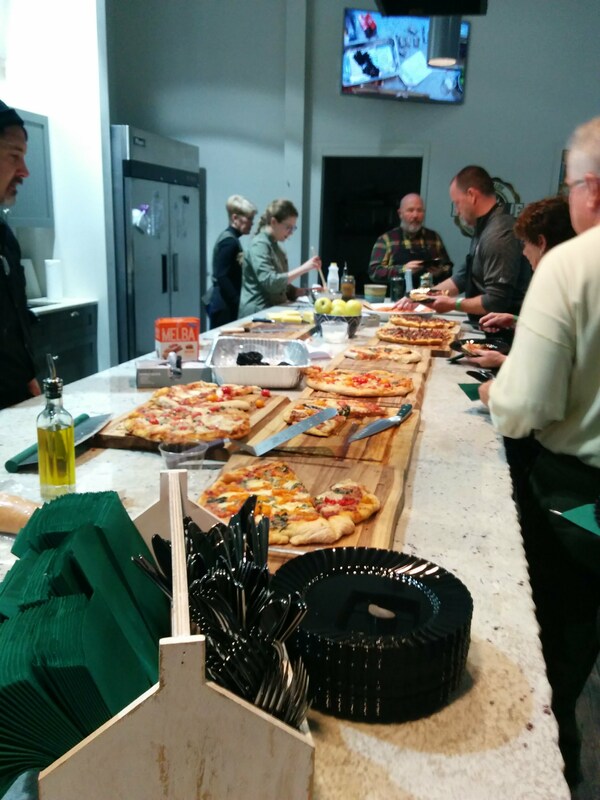 Each team had a different pizza to make – margarita, meat, and deep dish meat. We had the opportunity to form pizza dough and top the pizzas. 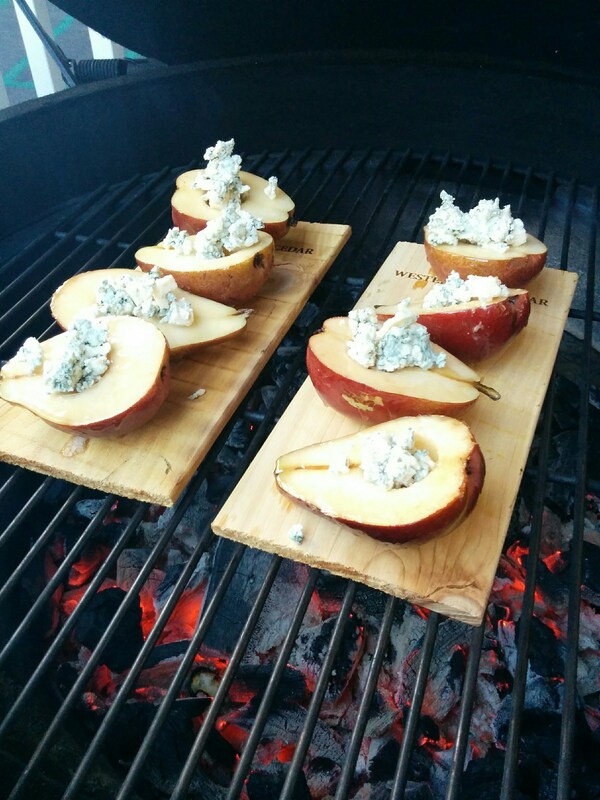 Then it was back outside to put them on the grill. Next, we watched as Chef Taylor prepared a smoked ham with a glaze before putting it out on the smoker again, and chunks of beautiful white cheddar for smoking. I began to worry what I had gotten myself into. This was way too much food even for the 50 or so of us. And speaking of food, it was now time for lunch. Out came the beer. 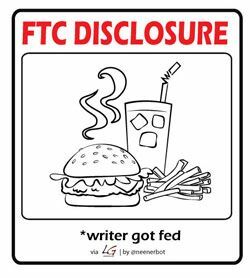 wine, and sodas and… the food. This round we had smoked salmon and our fabulous pizzas. I don’t think I want to cook a pizza any other way. These pies were mouthwatering with a crispy crust and just a little smokiness. So good. While we were eating lunch, the founders of Unicoi Preserves joined Chef Taylor to teach us how to prepare their Apple Cider Pepper Jelly pie. Did I mention you can bake on these things? Yes, apple pie. So much for those New Year’s resolutions! Then we broke into our groups again but this time we were encouraged to visit other groups because each group would be making a different dish. Group one prepared planked salmon and planked pears with bleu cheese, group two (my group) prepared jambalaya, and group three prepared salt block shrimp quesadillas. Once everything was prepped, out to the Eggs we went. Just about every Egg was in use. There was a flurry of activity as all 30 attendees, the volunteers, and the chefs milled about checking on the temperatures and the progress inside the Eggs. As each dish was finished, they were brought inside to rest. After the dishes were displayed on the demonstration counter, the piece de resistance finally made its appearance… the ribs. Mmmmmm! I’m so thankful I wore stretchy pants. Everything was excellent. The ribs could have gone a few more hours, but the class only lasted until 4pm, so note to self, low and slow for 12 hours. But that flavor was to die for. And the pie? Oh so good. The cheese straw crust, the crisp apples, and the sweet filling with the streusel topping will be the next pie I make. If you are in the market for a new grill and/or smoker, the Big Green Egg is an excellent choice. And if you get one, make sure you take the boot camp so you can learn the ins and outs of these wonderful tools. 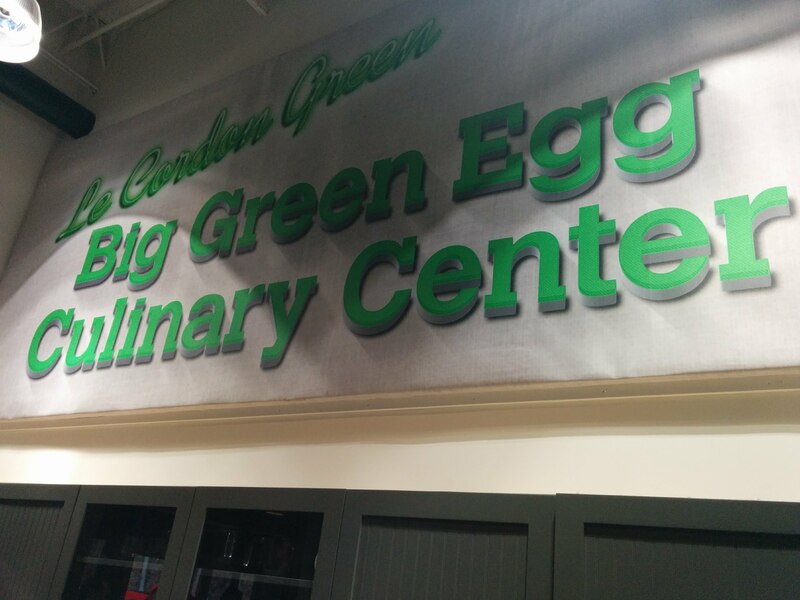 If you already have an Egg or if you are considering buying one, there are other events at the Big Green Egg Culinary Center from hands-on cooking to observation only meals. 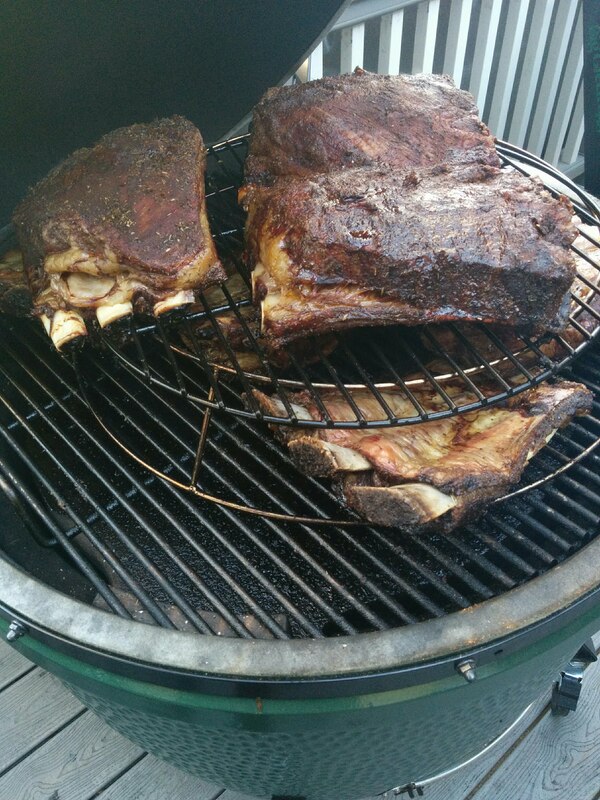 If you have a Big Green Egg, let me know what you think about it. And if you are looking for an event to test one of these grills, check out the Culinary Local site for upcoming events. Maybe I’ll see you at the Cast Iron Cooking event in February!